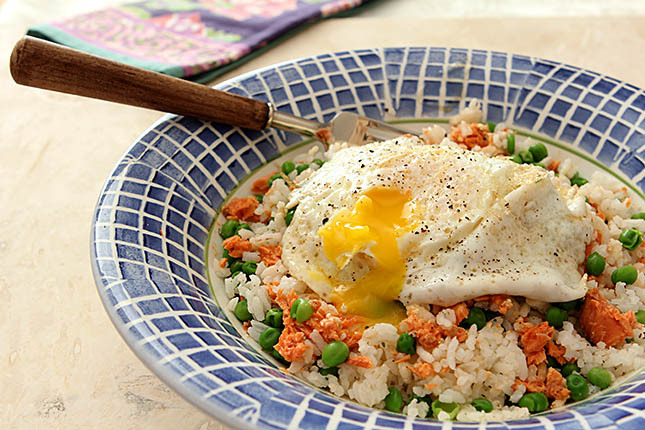 For a super easy meal, try this Salmon and Rice Egg Bowl with Garden Peas; this combination is great for breakfast, lunch, or dinner! Inspiration really does come in all forms. I know some people peruse volumes of cookbooks and magazines with photo spreads before them until something kicks in and they find a recipe or have an idea for one they would like to try on their own. Maybe for you it’s just a distant memory of something you loved as a kid that inspires you to do research and come up with something reminiscent not just of the dish but with it all of the memories they can bring. There can also be a huge yet gratifying challenge after coming home from a restaurant meal and finding yourself determined to re-create something you loved. I know, I’ve been there for each and every one of these examples but on a regular, day to day basis, my inspiration is often something quicker and thankfully much easier to fulfill. 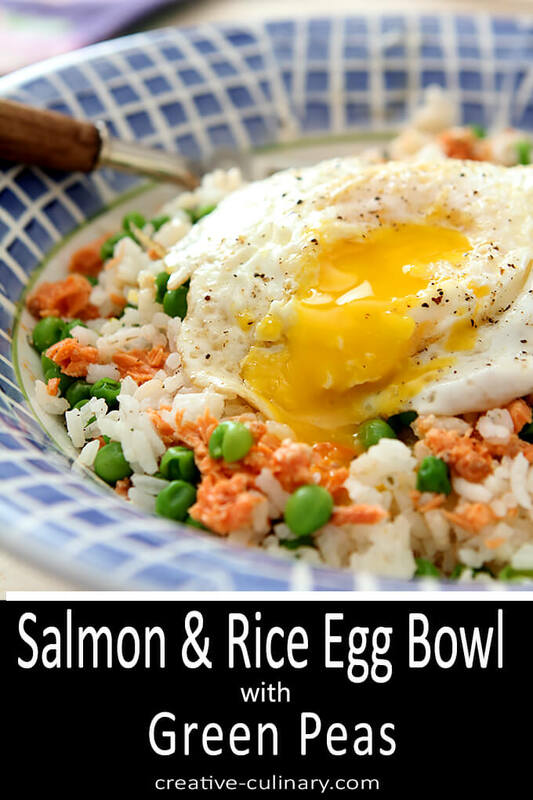 Today it’s simply the story of a Facebook post with a photo and next thing you know; I’m eating this Rice and Egg Bowl with Salmon and Peas for dinner! All credit to my friend Isabel from Family Foodie. 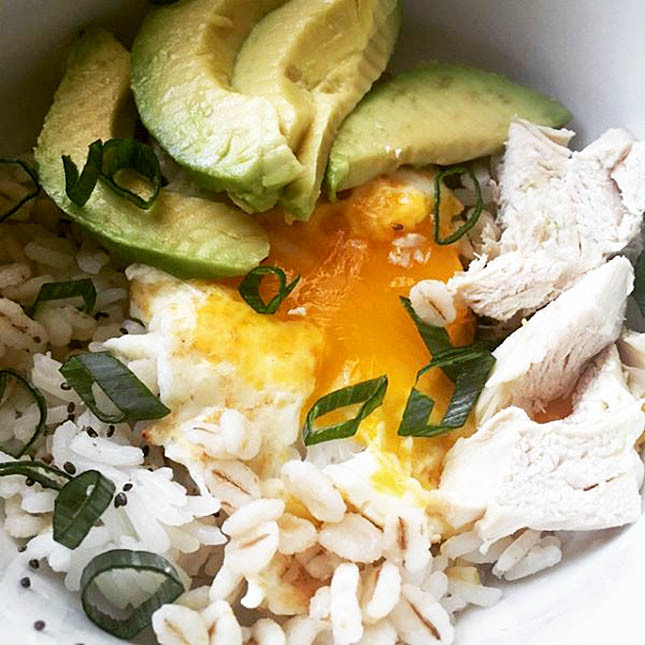 I noticed her photo of breakfast on Facebook; a simple bowl of rice, barley, chicken and avocado topped with a fried egg and even commented on how good it looked. Prophetically, this weeks theme of Food Network’s Sensational Sides is for rice so the timing was perfect. Maybe I’ve taken what is traditionally a side dish and made it the foundation of one that’s all inclusive in a bowl…but really, how convenient is that? Isabel’s photo planted a seed that grew all day and by dinner time her breakfast was the beginning of my dinner. Despite having no chicken or avocado in the house I knew I could find something to create my own rice and egg bowl. Rice went into the rice cooker and I had 15 minutes until it was done to find what I thought would make a good dinner. 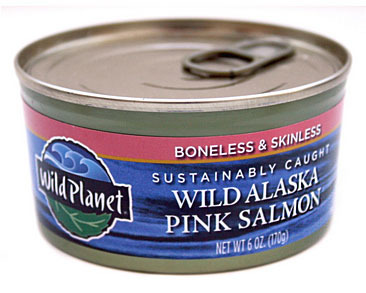 Luckily sitting on my counter were some products from Wild Planet including tuna, salmon, anchovies and sardines. In 2013 I was sent some samples of Wild Planet Tuna which I used to make these Tuna Burgers and they were so good everyone raved about them. So given the opportunity to work with them again, I jumped at the chance. Truthfully I love those burgers so much I wanted to make them again but since this was a spur of the moment dinner, those would have to wait and on this night my heart belonged to salmon. This salmon is so good that I honestly can say that anyone trying this dish would have never guessed the salmon came from a can. Everything about their company appeals to me including their company practices which include both fishing wild and sustainably. How could that not be right; maybe it’s part of why their products taste so dang good. As much as I loved this combination I’m already thinking of others too. My own simpler version of Tuna Nicoise with rice, tuna, black olives and an egg. Could I get away with a Caesar Egg and Rice Bowl with some amazing anchovies in the dressing in the mix? I bet I could! Of course not limited just to fish, try veggies, leftover beef, chicken or pork and I can certainly see shrimp. Seriously…I bet I could do this EVERY night. Look for my book next year! Rice is so versatile and a part of so many cultures. I wonder how many other foods are standard fare in so many countries? Off the top of my head I can think Asian, Mexican, Indian and Italian. I love it from plain to brown to my favorite of all; basmati. Join my friends and I and witness the widely diverse ways you can use this pantry staple in the preparation of foods for yourself and your family. Combine warm rice and peas with salmon in a bowl and mix gently. Season with salt and pepper. Melt the butter in a small frying pan and heat until starting to sizzle. Fry the egg to your liking (I love over easy but this is all about you!). 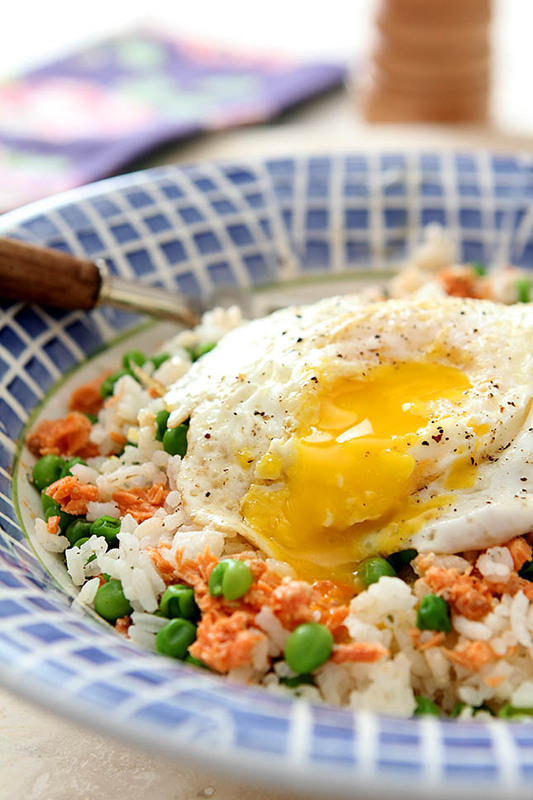 Top the rice bowl with the egg and season it with salt and pepper. I am so excited that I inspired this gorgeous dish. I can’t wait to try your version. It looks amazing and as far as I am concerned, an egg makes everything better. I love meals that look THIS good and come from the fridge and pantry. This is a keeper. I love something so good that I can make so fast; funny how I really do not have a fridge filled with food like everything thinks, right? 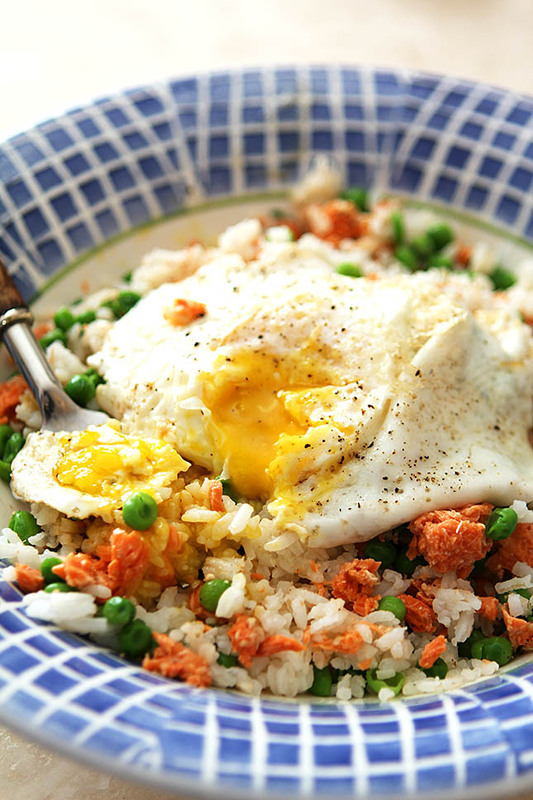 I love anything with an egg on it, but particularly grains dishes. I saw that same photo of Isabel’s and wanted it immediately. This is a great side dish, or for me – it’s also a great main dish for dinner! Great post, Barb! It’s sort of a main dish with the side being all inclusive right…and I could eat something like this a lot. I’ve done it with pasta for years, for some reason right now in the mood for rice. Yours looks divine too!